*Based on the results of the National Disease and therapeutic Index syndicated report among physicians who recommend a branded Glucosamine / Chondroitin or Glucosamine supplement, December 2009, and the results of the Pharmacy Times Survey among pharmacists who recommend a "bone / joint strengthener" dietary supplement, 2010. 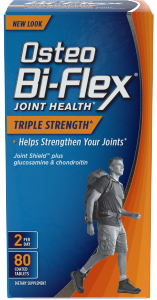 Osteo Bi-Flex® is manufactured under the highest standard for product quality, including purity and potency. FOR ADULT USE: Take two (2) caplets per day preferably with food. As a reminder, discuss the supplements and medications you take with your health care providers. KEEP OUT OF REACH OF CHILDREN. STORE AT ROOM TEMPERATURE AND AVOID EXCESSIVE HEAT. If you are pregnant, nursing, taking any medications, including blood thinners, or have any medical condition, consult your doctor before use. Discontinue use and consult your doctor if any adverse reactions occur. Not intended for use by persons under the age of 18. Contains shellfish (shrimp, crab, lobster, crayfish) ingredients. Individual results may vary.